Oral abstracts submission deadline - May 01, 2015. Poster abstracts submission deadline - June 01, 2015. 3-d International Laser Graduate School "Modern Problems of Laser Physics LGS-2009"
Moscow – Vyatichi, November 9 – 11, 2009. 15:00 S.A. Akhmanov Hall, Nonlinear Optics Bld. The International Laser Center of M.V.Lomonosov Moscow State University ioccupies the R.V.Khokhlov Nonlinear Optics Laboratory. 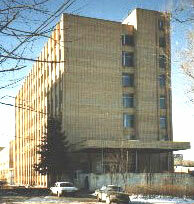 The R.V.Khokhlov Nonlinear Optics Laboratory is located on the University Campus at Vorob'evy Hills (the former Lenin Hills). It is shown in red at the map below. To get there you can take buses no. A-130, 103, 260, or trolly no. T-34 (all are shown on the map) from the University metro station (exit closed to the last carriage of your metro train if you travel from the downtown) to the "Sq. Indira Gandi" stop. Then , walk along the dotted line route. It takes some 10 to 15 min.